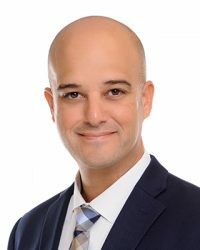 Dr. Miguel Garcia is a core faculty member in the Doctor of Physical Therapy program at the University of St. Augustine for Health Sciences Miami campus. He has been teaching in the Flex program since 2009. Dr. Garcia earned his bachelor’s degree in Biology and Exercise Physiology from the University of Miami, his master’s in Physical Therapy from Florida International University, and his transitional Doctor of Physical Therapy from Florida Gulf Coast University. Since entering the profession, Dr. Garcia has primarily worked with patients who have neurological disease in the inpatient rehab, outpatient rehab, and home health settings with an interest in patients who have suffered a stroke. During his career, Dr. Garcia has also served in various leadership positions, most recently serving as the director of rehabilitation at West Gables Rehabilitation Hospital where he oversaw daily operations for the therapy and case management departments and overall program development. He has served as a neuro instructor for both HealthSouth and Select Medical, providing extensive continuing education courses. He has spoken at local, state, and national conferences. Beyond his work for the university and the rehabilitation hospital, he also serves as a program surveyor for CARF (Commission on Accreditation of Rehabilitation Facilities).